Infrared Thermography involves the use of a highly specialized “camera,” to create a thermal image that visually reveals infrared heat energy emitted by an object. Failure-prone conditions, such as excess friction in mechanical equipment and high resistance in electrical systems, often result in increased heat energy. 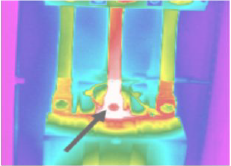 Infralogix skilled and experienced staff can easily identify these temperature anomalies with Infrared Thermography, allowing maintenance personnel to perform corrective measures before systems fail. 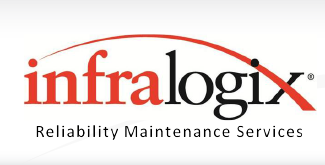 This technology is a highly versatile tool employed by Infralogix to provide inspections for a large variety of systems and equipment (see below). Like other predictive technologies, InfraredThermography is also valued because it allows observation of equipment that is online, under load and without disruption of normal operation. Because of its effectiveness as a predictive maintenance method, Infrared Thermography has been adopted as a primary tool of maintenance programs in all industries. It is recognized, recommended or endorsed by the following organizations: ASNT, ANSI, NETA, NFPA, DOE, NMAC and the United States Navy among others. Pre-job: confirm requirements, schedules and coordination with designated staff. Inspection: on-site thermographic survey of selected equipment or systems is performed by qualified and experienced Reliability Specialist. Critical or high-risk problems discovered during the inspection will be reported immediately. Reporting: a detailed report will be generated to include complete equipment list, status of equipment at time of inspection, problem findings and corrective recommendations. Report can be provided in hard-bound or digital format. Follow up inspections are available as requested or needed. » Looking for information on IR windows for electrical panels?